SpaceX cancelled the launch of its powerful Falcon Heavy rocket from Cape Canaveral on Wednesday evening due to strong upper level winds. Driving the news: The next chance for launch is Thursday, depending on weather. Why it matters: The launch will be the first time this rocket, which is the most powerful operational rocket on the market right now, will be used to launch a payload for a customer. SpaceX tested the rocket last February, along with simultaneous booster landings in Florida, to carry a red Tesla roadster into deep space. Details: Falcon Heavy’s 27 Merlin engines generate more than 5 million pounds of thrust at liftoff, SpaceX said on Wednesday. The rocket is essentially the combination of 3 Falcon 9 rocket cores. It can loft more than 140,000 pounds of cargo into low Earth orbit, beating the capabilities of the United Launch Alliance's Delta IV Heavy by about 77,000 pounds. The cargo for the launch is known as Arabsat-6A, which is a communications satellite for Saudi Arabia. 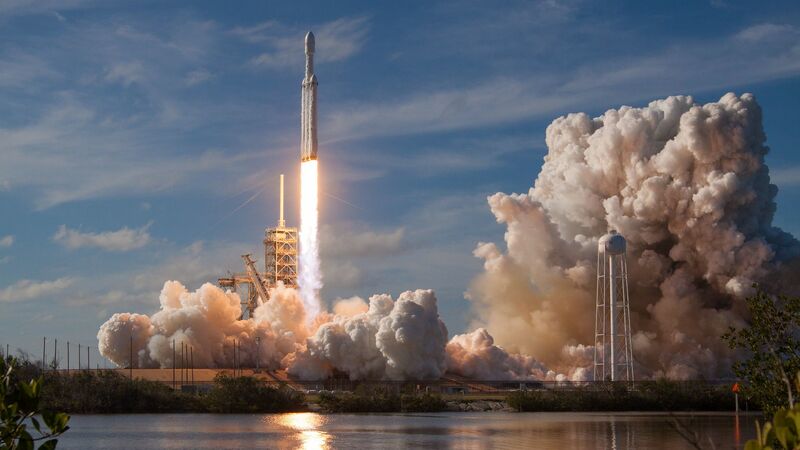 Between the lines: When the Falcon Heavy debuted, it lacked a long list of launch customers, unlike the Falcon 9, which has become a common sight in the skies around Cape Canaveral and Vandenberg Air Force Base in California. A successful launch could generate more interest, although the company has existing orders now from the Air Force, Inmarsat and the global communications company company Viasat.